This nifty little case from Cygnett is the perfect accessory for those people who work in industries where they are out and about such as building sites or people who with nature. Apart from working, it's also perfect for those in the sporting industry as well because the WorkMate Pro case has a high quality polycarbonate shell which enhances the protection of your iPhone 4 due to its ability for shock absorption. According to Cygnett, the product is made up of different layers of silicone combined with the polycarbonate shall that helps in absorbing shocks during falls. Given the protective nature of the WorkMate Pro, the product has a good texture surface which in turns adds additional grip and you have access to all controls on your iPhone 4. Compared to similar "work safe" cases, the design of the WorkMate Pro is quite bold in its design with either a black/grey or orange grey case. The orange grey case definitely stands out more but looks a little too safety looking like the safety jackets you might wear in a warehouse or building site. When installed, it does add a little more bulk to your iPhone but considering the shock absorption material used on the silicone case, it is a small price to pay, especially the high costs of the iPhone 4. The installation of your iPhone 4 into the WorkMate Pro is a breeze and within a few seconds, the iPhone 4 was comfortably fitted into the case. It even comes with a screen protector that is probably the most tricky thing to install. This screen protector adds an additional layer of protection by protecting your screen from scratches and gruff marks. With access to all ports, controls and connectors on your iPhone 4, it may not be the sexiest looking case around but when it comes to protection, this is definitely a case that you should investigate, especially if there is a chance that your iPhone 4 could be dropped. 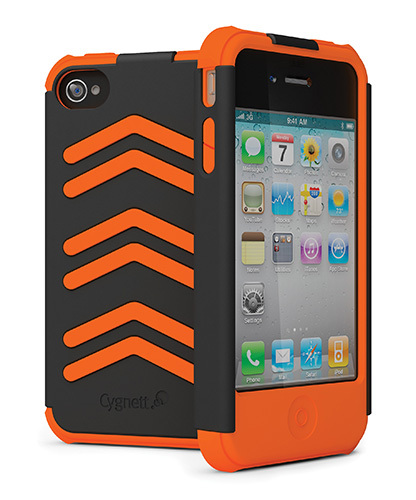 For more information, check out www.cygnett.com.au and the Cygnett WorkMate Pro is available at all good retailers.